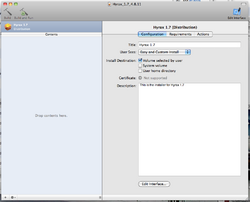 The goal of this build was to produce a set of OS-X package installers for Hyrax. This includes bundling all of the Hyrax dependencies in an installer. In addition, all of the installed files (Hyrax and dependencies) should be confined to a single directory (tree) for the release. For any given release I chose /usr/local/opendap/servers/hyrax-<version>. This abbreviated is throughout this section as $prefix. 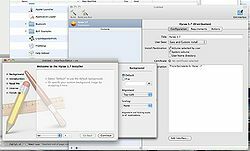 Note: This is based on Nathan's original detailed instructions for building on OS/X so that a MetaPackage installer can be made for Hyrax. I modified the shrew project for the Hyrax 1.6.2 release to do most of this in a semi-automated way. See Building Hyrax Dependencies for Nathan's original narrative of the process required. You can check out the shrew project at https://scm.opendap.org/svn/trunk/shrew. We often do not use that but a copy of the shrew project on a branch. This enables everyone to know when changes are going to be slated for the next (trunk) or current (branch) release. The branch for a particular set of releases can be found by browsing the SVN sources using Trac. A typical example is: https://scm.opendap.org/trac/browser/branch/shrew/hyrax_1.7_release, where the libdap, bes, et c., projects are referenced by the shrew project. You can use these targets to build a set of dependencies that are then used to build the various handlers and/or you can build a set of OS/X packages that can be combined into a single, huge, metapackage. There may be some utility in just doing the former, but this process has been developed with the idea that it will be used to make an OS/X metapackage for Hyrax. When the build is done, components of the server must be linked to the libraries they use and those same libraries must be in the same place when the server is run. NB: Building the dependencies installs Tomcat for you. We use the evironment variable $TOMCAT_DIR instead of $CATALINA_HOME because the latter is actually used by tomcat. 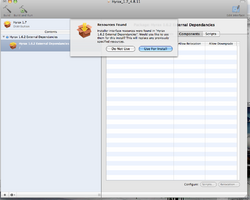 That said, make sure that if you have a value set for CATALINA_HOME it is the same as TOMCAT_DIR. If that's not the case, if CATALINA_HOME points to a different copy of tomcat, when you run the start up script (shrew/apache-tomcat-6.0.29/bin/startup.sh) it will start the copy of tomcat that CATALINA_HOME points to and not the one in shrew/apache-tomcat-6.0.29. In any case, make sure that the copy of tomcat you run actually has the opendap.war file in its webapps directory. If you're building a package/metapackage for a software distribution, make sure that the copy of the OLFS has a version number! To do that, build using ant -DHYRAX_VERSION=1.6.2 -DOLFS_VERSION=1.7.1 for example. Note that the shrew Makefile does this for you if you have set the $(olfs_version_arg) Makefile variable in Makefile.am correctly. That is, following this prescription, make world will build the OLFS, using the version numbers set in the Makefile and put the opendap.war file in tomcat's webapps directory. The Makefile.am used by shrew must be generic. It has a number of configuration values set for OS/X, but they are commented out since they break the Linux builds. These are particularly important for this package build because they are designed to help with configuring and building the handlers to use a completely self-contained set of dependencies. The make depends-pkg call below will build these and install them in $prefix/deps; these variables will ensure that the handlers use those and not some other set of libraries. # Only use these if you need them and make sure to double check the values. # other parts of the build will fail too. # to specify locations of the external libraries as needed. Where the $(release_params) or $(debug_params) are used as the value to ./configure for each of the handlers. So, uncommenting the lines shown in read will cause the handlers to look for the HDF4, HDF5, NetCDF, etc., libraries in $(prefix)/deps which was made by the depends-pkg target (in fact, the depends-install target also builds that directory). Make the server and install the bits and pieces in $prefix. This makes sure that the modules all link against the correct versions of the libraries (but it depeends on having $PATH set as described above. This step builds a single package that holds all of the dependencies, something not technically needed but a practical necessity for OS/X where things like netcdf4 and hdf5 are not standard parts of the OS. This package is left in the <top level>/src/dependencies directory. Installing all of the packages one-by-one is too complicated for most mac users, even those who are going to run a server. To get around this we combine all these packages in one giant blob called a metapackage. 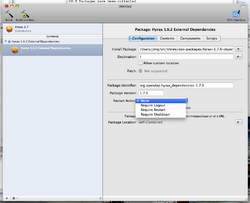 To build the metapackage, you need to combine the discrete packages by hand, using PackageMaker. The PackageMaker application is not hard to use, but you must attend to a fair amount of detail to get a MetaPackage that works correctly. Also, be wary of PackageMaker's tendency to crash when making large things like the metapackage; save often. Edit Introduction.txt. This is probably the most important thing to edit since it's the first thing the installer shows a user. Start PackageMaker and set the Organization to org.opendap and the Minimum Target to 10.5. In the upper right corner, click Edit Interface. This is where you set the installer's background image, license file, introductory text, etc. 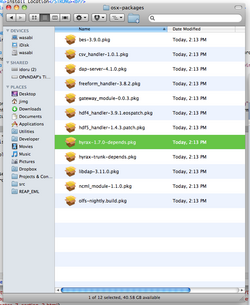 These are the files in OSX_Resources that were edited in the steps before starting PackageMaker. Click through the panes of the installer's interface and set the Welcome text to Introduction.txt, Read Me text to ReadMe.txt an License to License.txt. Now add the dependencies package as the first 'child' package of this metapackage. 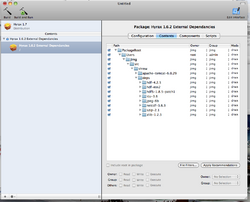 Use drag and drop from a Finder window to copy the package into PackageMaker's window for the new metapackage. Also make sure to check that the paths used when this child package is installed are correct (e.g., may sure the child package won't install into your /Users/... directory!). Lastly, and very important, make sure the child package won't trigger a restart - this is very tiring and is not necessary for Hyrax. Now add the Hyrax packages: libdap, bes, handlers and olfs. In that order. Make sure to set all of the options for each package (not to use the child package's resources, not to require a restart and to check the install paths) using the same values as were set for the dependencies package. If possible we should ask for user and group names in the install process. We should create the logs directory as part of the install and configure the bes to use it. Notes on the process for building Hyrax on OS/X that has now been mostly codified in the shrew project's Makefile.am and related scripts and/or here (for the parts regarding building the OS/X MetaPackage). This page was last edited on 29 April 2013, at 17:33.